You can now get aggregated views of the health and performance of all AWS resources through CloudWatch Automatic Dashboards. This enables you to quickly get started with monitoring, explore account and resource-based view of metrics and alarms, and easily drill-down to understand the root cause of performance issues. Automatic Dashboards are available in all AWS public regions at no additional charge. You can view your Automatic Dashboards here. CloudWatch Logs automatically collects VPC flow logs from 30+ services. You can also collect and store custom logs from your applications, server, etc. easily via CloudWatch Logs Agent. The Agent can be installed directly on a new or running EC2 instance as well as through CloudFormation or Chef. Follow the instructions here to install and configure. You can immediately start using CloudWatch Logs Insights to search and analyze logs sent to CloudWatch. You can write queries with aggregations, filters, and regular expressions to derive actionable insights from your logs. You can also visualize timeseries data, drill down into individual log events, and export your query results to CloudWatch Dashboards. Alternatively, you can use CloudWatch Logs Insights API for query execution or log data streaming to your current tool. You can also use metric filters to publish log-based metrics or to create alarms that notify you about potential operational issues. Learn how to create Metric Filters in the Console or CLI in the Amazon CloudWatch Developer Guide. If you are signed up for Amazon EC2, you are automatically registered for Amazon CloudWatch and EC2 instances are automatically enabled for Basic Monitoring at no additional charge. Amazon CloudWatch automatically monitors Elastic Load Balancers for metrics such as request count and latency; Amazon EBS volumes for metrics such as read/write latency; Amazon RDS DB instances for metrics such as freeable memory and available storage space; Amazon SQS queues for metrics such as number of messages sent and received; and Amazon SNS topics for metrics such as number of messages published and delivered. For more details about metrics for other AWS resource, please see the Amazon CloudWatch Developer Guide. Amazon CloudWatch can also monitor metrics that are generated by the applications you run on AWS resources. You can immediately send and store any metrics that are important to your business performance or your application’s operational performance using a simple API call. For example, you can have your application send web page load times via the API to be monitored in CloudWatch as a custom metric. You can submit as much or as little custom metric data as you need. All the same Amazon CloudWatch functionality will be available at up to one-minute frequency for your own custom metric data, including graphs, statistics, and alarms. For more details about supplying your own custom metrics, please see the Amazon CloudWatch Developer Guide. To start accessing your Amazon CloudWatch metrics, click the Metrics link on the Amazon CloudWatch tab of the AWS Management Console. All your AWS resource metrics and your own custom metrics will be listed. Find and select a metric of interest and an interactive graph for that metric will be displayed. Select a time range and choose to display values for Average, Minimum, Maximum, Sum, or number of Samples. Select additional metrics to add them to the graph in order to correlate behavior or discover patterns. Click the Create Alarm button to initiate automatic notifications or Auto Scaling actions when the metric reaches a threshold you set. Click the Dashboard link to view status overviews for all your alarms and AWS resource metrics. For more information on viewing, graphing, and publishing Metrics, please see the Amazon CloudWatch Developer Guide. To create your Amazon CloudWatch alarms, click the Alarms link on the Amazon CloudWatch tab of the AWS Management Console. All your CloudWatch alarms will be listed. Next, click the Create Alarm button and select the metric of interest. Finally, define the Alarm threshold and action to take when the alarm changes state. For more details on creating Alarms, please see the Amazon CloudWatch Developer Guide. To start using CloudWatch Events to react to changes in your AWS resources, click the Rules link, under Events on the Amazon CloudWatch tab of the AWS Management Console. Next, click the Create Rule button and select your event source and target. Click on Configure Details, give your rule a name, and click on Create Rule. For more details on Rules and CloudWatch Events, please see the Amazon CloudWatch Documentation. 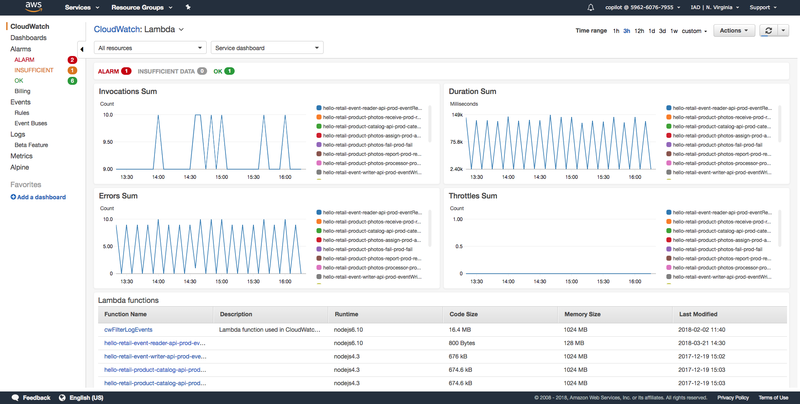 Amazon CloudWatch Application Insights for .NET and SQL Server continuously analyzes various application logs and infrastructure metrics to automatically detect common problems, such as failed SQL backups, impacting your applications. Once you onboard your .NET applications, you can identify and troubleshoot problems easily through system generated insights. You can then further drill into a specific issue with CloudWatch Automatic Dashboards that are dynamically generated. This capability is available in preview. You can learn more and request access to the preview by completing this request form.